ProWarm Backer-Pro insulation boards are made from high quality extruded polystyrene panels, covered with a fibreglass mesh on both sides. For use with ProWarm underfloor heating mats and loose cables. Not for use with underwood heating systems. They act as first class heat insulation for under floor heating systems. These tile backer boards can also be used as a superior waterproof surface for use under floor or wall tiles. Please note: the colour of the boards may vary, depending on the batch. 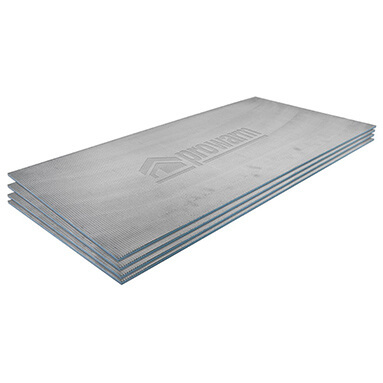 These Prowarm insulation boards should be installed on top of an existing concrete or timber sub-floor, and beneath the underfloor heating mats. The benefits are greatly reduced heat up times and running costs. When installing onto a concrete sub-floor, the Prowarm flexible tile adhesive is recommended. When installing onto a wooden sub-floor, the tile adhesive is recommended as well as screws and washers. Click here for full installation instruction manual (PDF) for Prowarm insulation boards!